Understand that Noah wasn't going to build just any ship, but a ship that would be able to handle the massive unforeseen "Great Flood of Judgment" that God was about to unleash against all of mankind. So it was imperative that Noah followed God's plan in its entirety. In the last article we had taken a closer look at who the "giants in the earth" really were. I'd pointed out that these so-called giants, were simply powerful men, who had held very authoritative and influential worldly positions throughout the lands they'd operated in. I'd also pointed out that it was the daughters of these men that the sons of God were found to be attracted to. And because of this attraction, the sons of God would eventually intermingle and marry these women that were born unto these giants in the earth. I'd also pointed out, it would be the wickedness and corrupted influences of these "giants" and their daughters that would eventually lead the sons of God down a path that ended up taking them from the ways of the Lord. Not only did this passage reveal that God was disappointed, but it would also become an announcement to the human race overall. For the Lord also revealed that human race would soon be judged, for what they had allowed themselves to become. Nevertheless, before we journey forth into the recorded account of Noah. Let's take a brief look at something first. Let's start by taking a closer look at the great ship that was known as the Ark. Now keep in mind, although we'll be introduced to the record of the Ark in due time, there's some things that I would like to point out first, when it comes to this great ship. Understand that this particular passage deals with the instructions, or blueprints, God had given to Noah in regard to the Ark. Know that God didn't want Noah to build just any ship, but the Lord wanted a ship built that would be able to handle the massive unforeseen Great Flood of Judgment that the Lord was about to unleash against all of humanity. So it was imperative, and essential, Noah followed God's plan in its entirety. Now like I'd stated earlier, this page won't go into the Sacred Account of Noah at this time, but instead, it will point out some interesting things when it comes to the Ark. I guess you could call these "fun facts" when it comes to the ship, and its overall makeup. For starters, the Ark had a deck size of about 98,000 feet. This in today's time, would be about the size of twenty NBA basketball courts, if they were placed side-by-side and connected together. As for the animals that would inhabit the Ark, for forty days and nights, know that their population number would not exceed more than 35,000. Consider the fact that with the average size animal, being around what a sheep would be, it would have taken up to 150 railroad freight cars in today's time, in order to carried a load of this magnitude. And make no mistake, this wasn't a problem for the Ark, being that it had a carrying capacity of over 520 railroad freight cars, which was far more than the 150 that it would have needed for the this particular task. The Ark was about 1/3 the length of today's Oasis of the Seas (1,187 ft) which at the time of this posting, is currently the world's largest passenger cruise ship, which can hold up to 5,400 passengers. But in regards to the Ark at one point in time, it would be known as the largest built ship in world. In fact, it would hold this record, until the ship that was called the SS Great Eastern would come along in the year 1858. Know that the SS Great Eastern was an iron steamship that was 690 feet long, and could hold up to 4,000 passengers. Has Anybody Ever Seen the Ark? 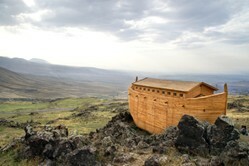 Now there have been plenty of reports, having statements from credible people that have claimed to have seen the Ark. And although no evidence has been found that would prove these reports to be factual. Or so they say...? Still know, these reports had indicated that the Ark had been sighted at the top of Mt. Ararat. Understand that this mountain is the tallest peak that's located, from within the country of Turkey. There have also been reports that have been made from American and Russian pilots, during the time period of World War II. There were also a claim that was made by a French explorer, who goes by the name of Bernard Navarra. He was able to cut a piece of wood from the Ark, and had it submitted for C-14 testing at two universities. Now the University of Bordeaux was able to conclude that the piece of wood, Bernard Navarra had submitted, was of great antiquity. The other university that tested this wood sample, was the Forest Institute in Madrid. It also concluded that the piece of wood, would be about 5000 years old. Now Navarra did write a book about his discovery of the Ark. The name of his book is called: Noah's Ark, I Touched It. Now I also like to point out that there are some reports, there are some from within the world, trying their very best to keep this evidence under wraps. For example, there was a report back in 1953 that came from George Jefferson Greene, which indicated that while doing research for a company, he had worked for at the time, sighted what he believed to be the Ark, from the research helicopter he was riding in. He makes the claim that he was very close to the site, which was about 90 feet above Mt. Ararat. Greene was able to take numerous pictures, of what was described, as a very large and strange looking wooden object. Know that the researcher had these pictures developed, and many people had the privilege to be able to see them. But unfortunately, Greene was later found murdered, and those pictures that he had of the Ark, were stolen, and have remained missing ever since. In the next article, now that we've gone over some fun facts, conspiracy theories, and mysterious, when it comes to the Ark. We'll begin to journey forth in our next article, by taking a closer look at the man that God used to build this magnificent ship. A man who had went by the name Noah.